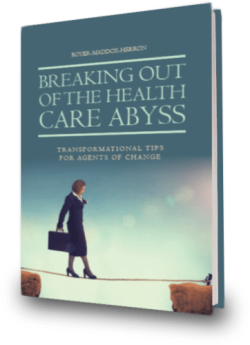 “Breaking Out of the Health Care Abyss” is a guidebook for how to survive the continually changing hospital and medical services business environment. Penned by Thomas Royer, Peter Maddox and Jay Herron, the 13-chapter treatise is an analysis of the biggest flaws occurring in management these days, along with alternate road maps to cross through the elaborate labyrinth. While the book is written from the 100-year combined health care management vantage point of the three hospital system experts, the learnings are applicable to most any business setting. As such, the compilation of tools, assessments and anecdotes can be a boon for any MBA or MPH student, entrepreneur, medical director or board member. The trio walk the reader through a business primer on Agents of Change based on their personal experiences. Via an honest delivery, the former C-Suite execs, turned confidential advisors to CEOs, share both faux pas and milestones. The reader of “Breaking Out of the Health Care Abyss,” becomes convinced that same old, same old is a sure fire way for losing the game. Rather, effective tools for guiding a company, network, advisory board or system to sustained growth and success often revolve around fearless actions based on future scenarios. In order to fully paint that picture, a few of the practices discussed are: Outside-In Thinking, Future Facts and Future Orientation. Thomas Royer, Peter Maddox and Jay Herron, collectively, have more than 100 years of experience in the cockpit of some of the most recognized healthcare organizations in the United States. Since 1999, they worked together in leadership/governance/management challenges domestically and internationally. They predicted, decades ago, what most would never have dreamed could become reality in the health care world. It is their intent to help readers successfully lead their organizations through a transformational journey in the current turmoil in the health care industry. Currently, presiding over Royer-Maddox-Herron Advisors, they steer their clients, in the U.S. and abroad, to break free from routines to embark upon truly ground-breaking, successful transformations.